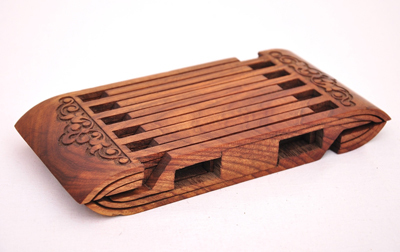 A lauh is a collapsible wooden rest for books, one of the most original articles ever produced by Uzbek woodcarvers. It is hard to believe that this sophisticated construction is made from a single piece of wood without nails, clay or hinges. Experienced craftsmen can make a lauh consisting of ten to twelve tiers. Apart from a book, it can hold pencils, small paper scrolls, writing pads, bookmarks and other reading and writing accessories. Initially, an outsider may be unable to use a lauh. While it is possible to cope with a single-tier lauh without assistance (providing you have watched at least once how to do it ) a multi – tiered book rest may turn out to be a veritable brain-twister. 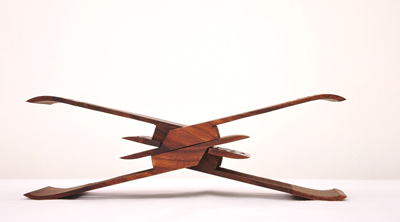 It even takes craftsmen a lot of time: first they have to put a lauh on its side, then spread it out and put its separate parts into the required positions, and only then it can be turned into the right position and placed onto the table. It is folded in the same order. A well-known Tashkent art critic, Shakhalil Shayakubov, believes that a lauh (rahle in Arabic) as a rest for the Koran was invented at approximately the same time the Koran was written. In contrast to present-day books, which one can hold in one`s hands without any difficulty and turn over the pages during the prayer, ancient folios were much more massive and heavy and consisted of hundreds of parchment pages and a leather cover often clad with metal plates for the sake of durability. Apart from convenience during the reading of the Koran, a rest also expressed a respectful attitude to this holy book, which could be carried without touching it with one`s hands. In the course of centuries the book rest changed its shape. We have no idea what materials lauhs were made of in ancient times. One can see representations of wooden lauhs in ancient miniatures. In Samarkand, in the yard near the Bibi Khanum mosque, there is a rest for the Koran made of marble at the beginning of the 15th century by order of Mirzo Ulugbek, which is indicated by a legend carved at its base. For a long time it was believed that the secret of making lauhs had been lost. 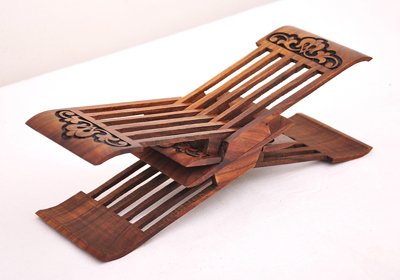 In the 1980s several craftsmen decided to revive this ancient kind of woodcarving. The first ones to do so were Ortyk Faizullaev, Zeinal Alimbaev and Akmal Azlarov. Lauhs were made in Tashkent, Kokand Namangan, Samarkand and Khiva. Tashkent, Kokand and Samarkand craftsmen made multi-tiered constructions. It is worth mentioning that each lauh, even the simplest one, is absolutely different from the others,: each of them is unique. Outside Uzbekistan – in Syria, Iran, Iraq, Saudi Arabia, India, Indonesia and Malaysia one can often see book rests made of two intersecting boards. Some of them are richly decorated with gems, while others are inlaid with mother-of-pearl or decorated with lacquered miniatures, wood or ivory carving. However, only in Uzbekistan are these lauhs produced. Even undecorated lauhs produce a strong impression by their sophisticated construction. Source: This article, written by Galina Yudina, was first published in Uzbek Airways in-flight magazine. Part #2 will be published next week.